I went trillium hunting at Warwoman Dell. I did find a few just starting to come up but, none with flowers on them. One had a bud. On the right is a photo of a clump of Round Leaved Violets that was growing along the trail. Trail conditions are fairly poor as several trees have fallen across it during the winter. In a couple of weeks I expect the trilliums to really begin their season of blooms. 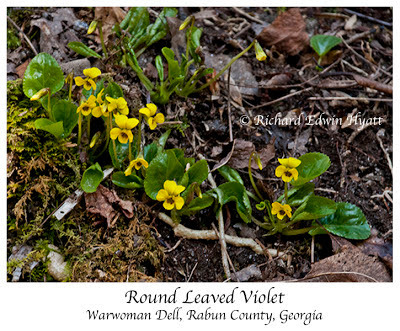 Love those round leaved violets! Glad you shared them here!